Alex Ekwueme Federal University Ndufu-Alike, Ebonyi State Warns all Prospective UTME Candidates to Beware of Admission Racketeers and Fraudsters Promising Admission in 2018/2019 Admission Session. The Management of Alex Ekwueme Federal University Ndufu-Alike, Ebonyi State wishes to alert all candidates of the just concluded Post-UTME Screening Exercise of the university and indeed the general public of a syndicate specialized in defrauding unsuspecting candidates of their money in the name of offering them admission into our university. We wish to make it categorically clear, that admission into any of the university’s academic programmes is strictly based on merit and other guidelines as stipulated by Joint Admissions and Matriculation Board (JAMB). 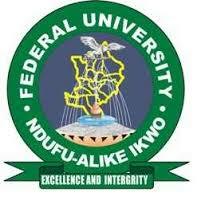 Thus, AE-FUNAI does not sell admission and has not directed anyone to do so on its behalf. Consequently, any candidate that offers money to anyone for admission into the university is doing so at his/her own peril. The University or it’s Management shall not be held liable for such criminality.